ASTANA – Kazakh officials were briefed during a meeting in Tallinn at the end of March on Estonia’s digitisation successes. Estonia is considered a leader in IT-based logistics and business services and the meeting came as Kazakhstan embarks on its national digitisation programme. Estonia is ranked first in Europe in the Global Index on cyber security, second globally in terms of legislation on information and communication technologies and fifth in global cyber security index rankings. Estonia has invested in IT over the past 25 years resulting in approximately 3,700 IT and tech companies operating in Estonia, from start-ups to transnational corporations working in game development, finance, e-commerce, green technologies, trade and e-government. Tech businesses make up 6.8 percent of Estonia’s GDP, constitute 14.2 percent of exports and allow Estonians to do business with more than 120 countries. During the meeting, Estonian Minister of Internal Affairs Andres Anvelt briefed Kazakh Deputy Prime Minister Askar Zhumagaliyev on Estonia’s electronic population register, state border register and crime register systems. Ninety-eight percent of Estonia’s population have electronic IDs and more than 33,000 business people use smart cards to sign contracts, receive financial services and manage their businesses. The cards, say Estonian officials, create a safe space for online services. 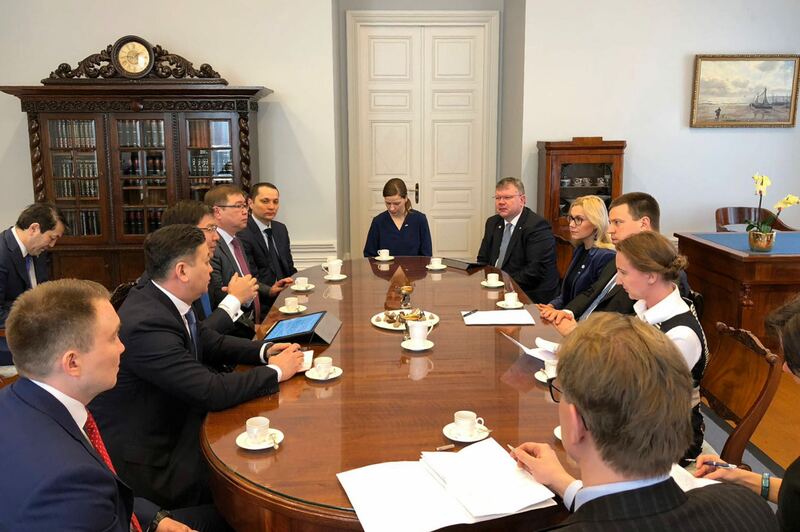 The sides also discussed Estonia’s X-Road project, a communication and database system that links the public and private sectors to electronic support services. In X-road, outgoing data is signed and encrypted in digital format, and incoming data is checked for authenticity and registered. The e-government of Estonia has also introduced an electronic taxation system that makes default calculations and allows filing tax returns with the click of a mouse. The country is also working to use digital tools to improve healthcare. The Kazakh delegation visited Tallinn IT College, which is one of eight universities and 14 business accelerators where companies and investors cooperate on high-tech projects. It is introducing IT into its industrial sector with its Industry 4.0 programme. The programme seeks to allow entrepreneurs to use IT from the business planning stage to final product delivery, including electronic customs. The Kazakh delegation headed by Zhumagaliyev also met with Estonian Prime Minister Jüri Ratas and Minister of Economic Affairs and Communications Kadri Simson. Kazakh officials also met with Director-General of the Estonian Tax and Customs Board Valdur Lyde, Co-Chairman of the Kazakh-Estonian Parliamentary Group Denis Borodich, President of the Estonian Information Technology College Pieter Lawrence and business leaders.